BeeKind Eco Friendly Wooden Briquettes in Gloucestershire. High density sawdust and wood chip briquettes the best and economical alternative to fire wood logs or coal. Our wood briquettes are ideal for stoves and open fires. 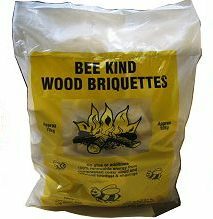 BeeKind Wood Briquettes for open fires and stoves. Wood briquettes are ideal for open fires, ovens, chimeneas, wood burning stoves and BBQs. Wooden briquettes are recognised as being ideal to burn due to their high calorific value. Generally the larger the diameter briquettes burn longer and give out most heat, our briquettes are 65mm diameter. No glue or additives, 100% renewable energy from compressed cedar wood and redwood sawdust and shavings that burns completely to ash and can simply be placed on your garden. The carbon dioxide (CO2) balance is even, because wood briquettes release just as much CO2 to the atmosphere as the tree absorbs through growth making wooden briquettes eco-friendly. phone 01452 700289 to place your order now. Bring us your unwanted sawdust or shavings - must be clean, under 18% moisture and not contain any MDF, chipboard or plywood. Any questions phone 01452 700289. Get your money back when you order a full pallet. Briquettes can also be purchased from our shop.